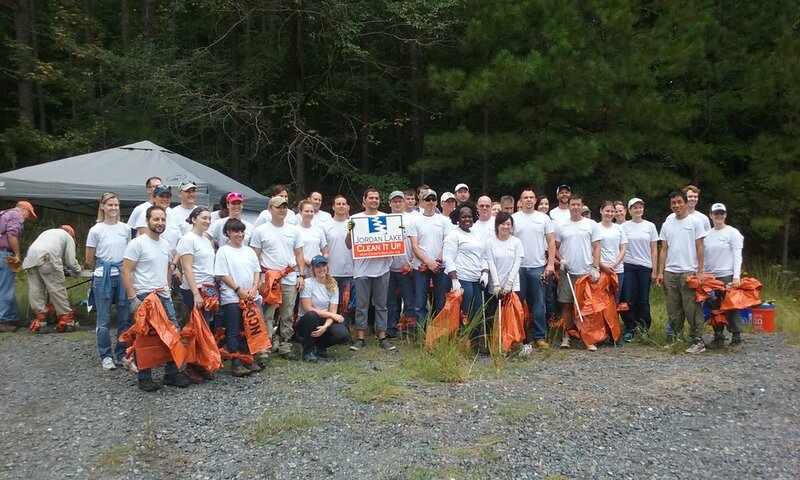 Biogen Idec's We Care Deeply community service with CJL took place in late Sept. This was the 4th year of participation with us. Knowing employees have a choice of doing service on that day from among many causes, we are grateful that 43 of them selected CJL! Some of them had also come in previous years. The target area was a section of shoreline on the east side of the lake just north of the Corps of Engineers' spillway. It is just about opposite where the Haw River flow enters the lake. That means the site falls victim to a huge trash load with every rainfall. We divided the group into 3 tracks with CJL leaders for each. Thank you, David Piet and David Field, for volunteering as leaders. In just 2 hours, these Biogen Idec volunteers had removed 90 very full bags of trash and 1 tire and helped haul them via the Corps of Engineers pontoon boat to a nearby dumpster.